Evel Knievel. You probably know the name even if, like me, you don't know much about the man behind the legend. 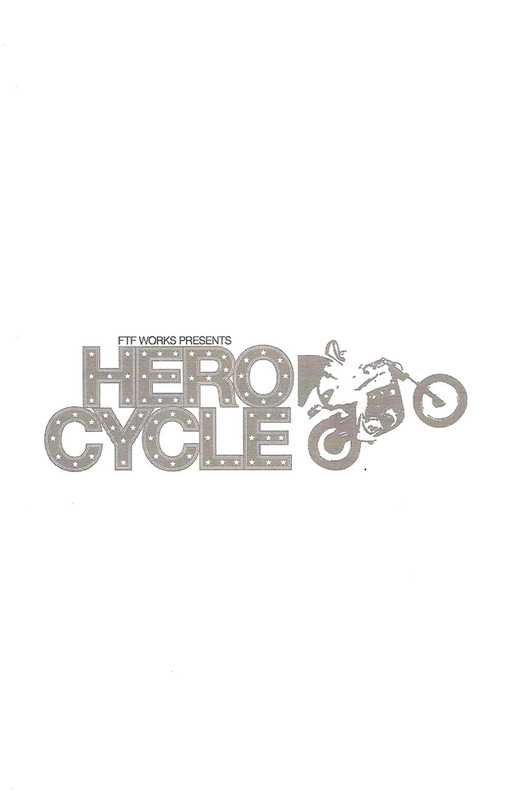 FTF Works' Herocycle, a remount of a 2008 Fringe show, explores the life of Robert Knievel in a creative and innovative way, using aerial acrobatics, circus tricks, music, and the work of Joseph Campbell. The result is a really unique, physical, and captivating piece of theater. This is a work that doesn't really follow any conventions of theater, so it's hard to even know where to begin describing it. So I'll just jump right in. Evel Knievel, the famous daredevil who made a career out of jumping his motorcycle over cars, animals, and various other objects, is played by two actors, Erik Hoover as Robert Knievel and Jim Peitzman as the alter ego he created for himself. The two often debate, the daredevil side convincing the human side to take greater and greater risks. 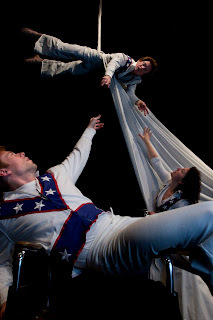 Robert spends much of the show in a wheelchair, representing the cumulative three years he spent in the hospital recovering from various crashes, while Evel is often flying overhead on aerial silks, irrepressible. Both are dressed in Evel Knievel's trademark white suit with the stars and stripes, like 70s superheros, as is Beth Brooks, who is credited as "Reporter, Goddess" but serves as a sort of narrator and guide through the story. We learn a little bit about Robert's life and history, with Sasha Gibbs playing his wife and a groupie. Both Beth and Sasha sing at times with a fantastic band (original compositions by Sam Brooks, and a special shout out to violinist Maliya Gorman-Carter who at one point plays while suspended from the air), although this is not a musical. But most remarkable of all is the physical way all of the cast moves about the space, which is populated with various size ramps, jumping, rolling, spinning, flying. It's exhausting and fascinating to watch. Every time someone (usually Jim) was up in the aerial silks I couldn't take my eyes off of them, especially when Jim went into an almost free fall descent, stopping a few feet from the ground. It's a clever way to show the daredevil aspect without having an actual motorcycle jumping through the air onstage. I find myself drawn to stories of people who take great adventurous risks in the pursuit of something that they usually can't even explain themselves. It's a drive that some people have to challenge themselves, just to prove to themselves (or the world) that they can do it. 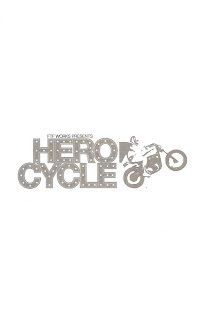 It's the same thing that drove Nik Wallenda to walk on a tightrope across a gorge near the Grand Canyon just a few days ago, something that Evel dreamed of doing on a motorcycle. (Perhaps it's the same thing that drives me to run marathons and go on "vacations" where I hike all day instead of lay on a beach, like most people do on vacation.) When George Mallory was asked, "Why do you want to climb Mount Everest?" he famously replied "Because it's there." I suspect Evel Knievel would have responded in a similar way if asked why he wanted to jump 15 buses on a motorcycle. Joseph Campbell explored commonalities across cultures and their stories, and the archetype of a hero that is present in all of them. I'm not sure if Evel Knievel was a hero, but he was definitely on a journey towards something or somewhere, whether or not he ever reached it. And there are many similar stories on smaller and grander scales throughout the world and its history. I don't know if I did Herocyle justice (it's a little hard to wrap my head, and words, around it), and I'm sorry if I rambled a bit there, but that's what good theater does - make you think, explore new ideas, and make connections. This piece, created by Erik Hoover and Kym Longhi, is the most creative thing I've seen on stage in quite a while. The actors and musicians are all wonderfully expressive, the costumes are awesome, the moving set pieces are interesting but never in the way of the story. The whole package is unique and creative, a little odd, but just a fascinating creation. Only two performances remain, so get there fast if you're interested in exploring a little.